AUGUSTA — All public high schools and middle schools in Maine would stock the overdose antidote naloxone under a plan being developed by the Mills administration that echoes national efforts to combat the threat of opioids. Gordon Smith, the state’s director of opioid response, said having the antidote on hand in a school building could save the life of a student, staff member or visitor. The administration is also working on improving prevention education and may expand it to grades as young as pre-kindergarten, Smith said. Although a growing number of states are embracing access to naloxone in school buildings, the idea of doing so in Maine is raising concerns among some educators and lawmakers about normalizing drug use and imposing more responsibilities on school staff. Still, Smith said being able to reverse an overdose in school with an easily dispensed nasal spray version of Narcan, the brand name for naloxone, should be widely embraced by the education community. “I don’t think anyone wants to see a kid die because we don’t have it available,” Smith said. He said Gov. Janet Mills would prefer to see local school districts voluntarily embrace a staff training program, but if need be the administration would back legislation to make it mandatory. Maine is grappling with an opioid crisis that has been claiming lives at the rate of one a day for several years. There were 418 drug overdose deaths in 2017, including 354 caused by opioids such as fentanyl, heroin and prescription painkillers, according to the Maine Attorney General’s Office. Totals for 2018 aren’t available yet, but the office is projecting a decrease to 307 opioid-related deaths. It’s unclear how many overdoses have occurred on school properties in Maine. State records on fatal overdoses show that most involve people beyond their high school years. Among the 960 deaths from opioid overdoses in Maine from 2014 to 2017, 76 people, or 8 percent, were younger than age 25, according to the Kaiser Family Foundation. Pender Makin, the state education commissioner, said in a written statement that she has seen how the opioid epidemic affects students and their families. “I believe that we need to take all measures that have the potential to save lives and guide people, and our community, to recovery,” she said. The city of Portland has had naloxone at its three public high schools since the 2017-18 school year, said Tina Veilleux, the school nurse coordinator for Portland Public Schools and the nurse at the Reiche Community School. “School nurses have to deal with any emergency that comes up on the grounds, on the campus, and sadly that could certainly be one of them and nurses want to be prepared,” she said. Veilleux said the overdose antidote has not been used in the Portland high schools. She supports the idea of broader distribution to other high schools and middle schools in Maine. The National Association of School Nurses, which includes 16,000 members nationwide, issued a statement in 2016 endorsing the distribution of naloxone in schools as a preparedness response to the nation’s opioid crisis. Mills, Maine’s former attorney general, has taken an aggressive approach to increasing the distribution of the antidote and clashed notably with former Republican Gov. Paul LePage, who rejected calls for easier access to naloxone while he blocked for months a law that allows the antidote to be issued by pharmacists without a prescription. In 2016, Mills went around LePage using funds from her office to provide naloxone to 26 different police departments in Maine, which subsequently reported repeatedly using it to save lives. Mills and Smith most recently announced a pilot project to put the antidote in public buildings in the same way that automatic external defibrillators, used to treat sudden cardiac arrest, are made available. Naloxone is an opioid antagonist that works by binding opioid receptors in the brain, reversing and blocking the effects of other opioids, according to the National Institute on Drug Abuse, an agency of the federal government. While it can stop or slow down the effects and quickly restore normal breathing in a person who has overdosed with heroin or prescription painkillers, the medication does not help with the underlying substance use disorders. Most recently it has become available in a nasal spray that can be easily administered by police or other emergency responders and requires little or no medical training to administer. About a dozen states, including New Jersey, Virginia, Maryland and Rhode Island, have passed laws that provide naloxone in public schools, coupled with training for school employees. Some of the state funding has been supplemented with grants from Adapt Pharma, the company that markets Narcan. The company cooperates with the Clinton Foundation on a program to provide two free doses of naloxone to any high school in the nation that requests it. Since 2016, the foundation has distributed more than 6,000 doses of the antidote to more than 1,000 high schools, colleges and universities. Other states, including Alabama, have also recently passed legislation allowing school districts to voluntarily enroll in state-funded naloxone programs that provide training and supplies to the schools that want it. In March, Virginia’s Democratic Gov. Ralph Northam signed into law a bill that allows school nurses to administer the antidote. That’s the route state Sen. Scott Cyrway, R-Benton, a retired deputy sheriff and state coordinator for the Drug Abuse Resistance Education program, said he could support. Cyrway said he would likely oppose putting naloxone into the hands of all teachers or requiring that it be universally available in public schools by state mandate. Cyrway also said that if naloxone is used in a school, a school resource officer should be involved in that process. He said he supports the goal of expanding prevention education to lower grades but would like to see the state adopt the D.A.R.E. curriculum, driven by law enforcement, which covers grades K-12 with age-specific lesson plans. Smith said D.A.R.E.’s curriculum is something that he and Mills are considering, but both are skeptical of the effectiveness of D.A.R.E. programming overall. School officials and teacher union representatives offered qualified support for the idea of having naloxone available in all middle and high schools in Maine. 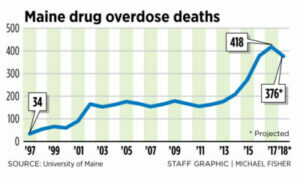 Grace Leavitt, executive director of the Maine Education Association, the union that represents most public school teachers, said teachers want to do their part to help combat the state’s overdose crisis, which still claims on average one Maine life each day. But the union would be opposed to a mandate requiring teachers to be trained to dispense naloxone, especially if it came without funds to support it. Leavitt said a program that allows teachers to volunteer to be trained to dispense naloxone would be more readily embraced. “Schools are used for a lot of community events by the public,” Leavitt said. “This is a significant public health issue, so having Narcan available for use by the public at events is certainly important and needed. Equally important for the MEA, Leavitt said, would be an effort to ensure that each Maine high school have a full-time nurse on duty. Currently, many districts have a single nurse who serves multiple schools. Likewise, some Maine high schools don’t have a school resource officer available every day. Veilleux, the Portland school nurse coordinator, agrees that any program for teachers and naloxone should be voluntary. She said not all school staff members are going to be willing or able to administer naloxone. She said expanding prevention education is also important and that simply making naloxone more available and talking about the issue openly helps remove the stigma from substance use disorders and build awareness of the disease. “There really are not too many people who have not been affected by this,” she said. Steve Bailey, executive director of the Maine School Management Association, which represents the state’s school superintendents and school boards, said administrators are going to want specifics on how naloxone in schools would be rolled out in Maine. Bailey said he didn’t believe there would be widespread opposition to making the antidote more readily available by having it in public schools, but the details of how that happens will be important to work out. “Knowing the benefit that’s there with it, it would seem to be a very positive opportunity for that to be available within school districts,” Bailey said.